Aluminum disc blanks are widely used in industry, as we all know, aluminum discs as one of the basic products of aluminum metal, is the basic model and the initial form of aluminum products. It has all the advantages of aluminum and also have its own advantages. Therefore, it has been widely used in various industries and products of industrial production. We may know that the aluminum disc blanks are used in making cook utensils, for traffic sign, for lamp cover and so on. The aluminum circle blanks has the characteristics of smooth surface, scratch free, and suitable for anodization. It can supply users to produce various products in the form of cold extrusion, such as some shells, hoses, protective covers and so on. At the same time, it also has prominent applications in electronic and electrical appliances, daily chemical and automobile manufacturing. It has been applied in aerospace field, and even in military industry. Aluminum disc blanks with small diameter and large thickness can be called as aluminum slugs, it is another type of aluminum circles, and it can be applied in packing industry, especially for cosmetic and beverage package. 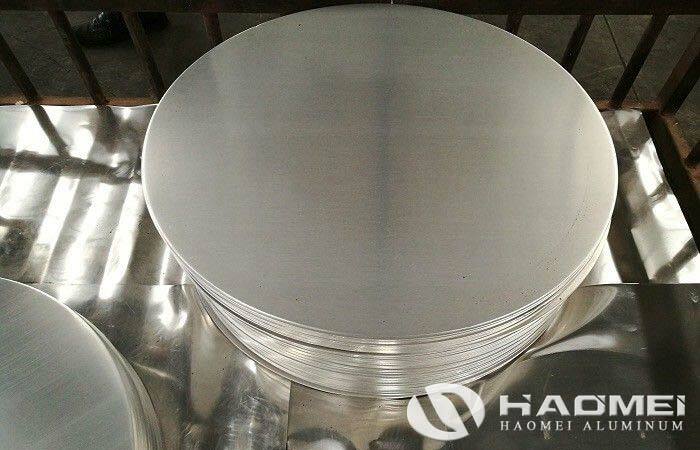 The size of aluminum circle affect the application area, the quality of aluminum discs affect the application product, thus, quality assurance and inspect seems to be very significant, thus Haomei Aluminum adopt advance cutting machine for producing aluminum discs without burr and beautiful surface for meeting the requirements of customers.